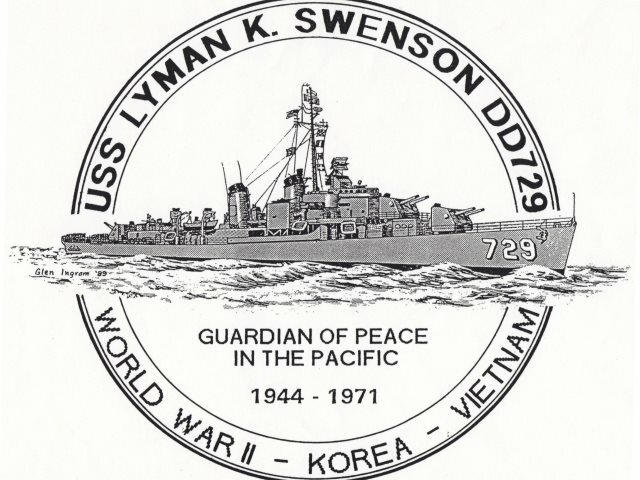 The USS Lyman K. Swenson DD729 Sailors Association is a "not-for-profit" organization dedicated to preserving the history and memories of the USS Lyman K. Swenson DD729, identifying and locating former crewmembers, and encouraging comradeship among those crewmembers through newsletters and an annual reunion. The Association Roster & Directory currently lists over 500 former crewmembers. Annual membership dues are $30 (not tax deductible). Due by February 1st each year. However, as noted in the official newsletter, "Pride prevents most shipmates from admitting that paying membership dues might present a hardship on their budgets." If anyone knows of any shipmate "hardship" cases, they should advise the Association Secretary. Widows of crewmembers are considered honorary members and are exempt from dues. Former crewmembers interested in joining the Association may send $30 (check or money order, no cash please) to the Association Treasurer. Please be sure to include your full name, spouse's name, postal address, email address, phone number, current occupation, years on board Swenson, highest rate/rank while on board and whether or not you retired from military service. Or use the Membership Application/Annual Dues Submission Form. Requires Adobe Acrobat Reader - download free HERE.